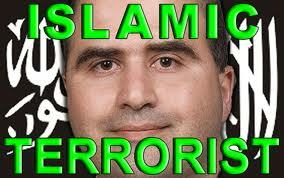 While everybody is focused on the three-ring circus that is Attorney General Eric 'Fast & Furious' Holder, the theater of the absurd continues as Nidal Hasan, the Army psychiatrist charged in the 2009 Ft. Hood shooting...you know the one Obama deemed 'workplace violence'...is now petitioning the court to represent himself when he goes to trial. Instead of just turning a blind eye to yet another of Hasan's never ending requests, yesterday, military judge Colonel Tara Osborn ordered Hasan to undergo a physical exam to determine whether he’s physically capable to do so (Hasan is paralyzed from the chest down from gunshots fired during the attack by two Ft. Hood police officers) after ruling him mentally capable to defend himself, and issued a statement through a Ft. Hood spokesman, “The judge noted that a prior inquiry into Hasan’s mental health indicated that he had the mental capacity to conduct and assist in his own defense." Now ordering the government to conduct the physical exam and file a medical report by tomorrow so she can rule on the results at Monday's scheduled hearing, this judge has been trying to keep the trial on schedule after countless Hasan initiated stalling tactics, including his stellar performance that as a muslim he should NOT be required to shave his beard to comply with military rules (Osborn set that issue aside). And if by some chance the judge refuses Hasan’s request to defend himself, rest assured he will appeal to higher courts and request the trial be stayed, causing even further delays. And so the delays will continue one way or another while we taxpayers foot the bill to keep Hasan well fed and laughing at how he's made a mockery of our justice system, because he knows that by defending himself new avenues for appeal become available if he's found guilty, and we all know he's guilty as charged. Defending himself also means that he’ll be able to question and cross-examine witnesses, including the very people he's charged with wounding, along with the family members of those he murdered in what was, whether Barack HUSSEIN Obama likes it or NOT, a terrorist attack. But gentleman that he is (insert sarcasm and look of utter disgust here), Hasan has graciously offered to plead guilty on all charges if the death penalty is taken off the table (something he has previously twice asked for). 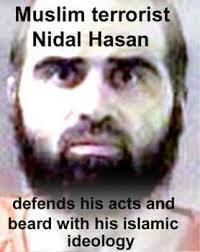 Judge Osborn again refused the request because under military law a defendant cannot plead guilty to a capital death penalty crime, making Hasan's offer just more theater, and believe me he knows damn well the military rules regarding his type of case. And it gets even more bombastically infuriating as in this theater of the absurd Nadal Hasan continues to get paid, racking up at least $278,000 in salary to date as he awaits the court-martial proceedings to begin, because under the Military Code of Justice, Hasan’s salary cannot be suspended unless he's proven guilty. 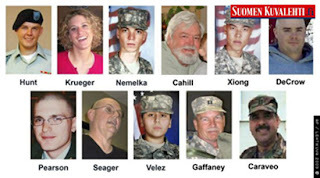 Never mind that the people he injured all saw who shot them...never mind that he was seen murdering 13...never mind all that because the Military Code says he has to be officially adjudicated with a guilty verdict before his pay can be suspended or forfeited. 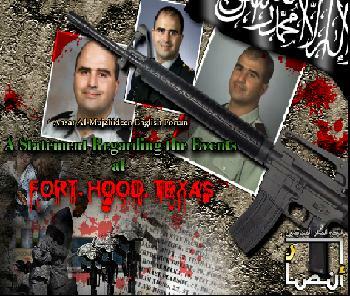 And this is being played out while the victims are still being denied the Purple Hearts they so rightly deserve...Purple Hearts deserved because they were indeed injured in battle NOT in an act of 'workplace violence' for this muslim bast*rd kept shouting 'allahu akbar' as he pumped bullets into them...Purple Hearts that would allow the victims additional medical care and benefits for their families. And while the judge will explain to Hasan the many disadvantages of defending himself against 13 premeditated murder charges and 32 attempted premeditated murder charges, if she does rule Hasan is physically competent to represent himself at trial, she most probably will insist that defense attorneys be present to assist Hasan if he needs it, as military rules allow a judge to require a defendant representing himself pro se to still be advised by military lawyers thus preventing a possible mistrial due to what will assuredly be theatrical outbursts by the defendant. 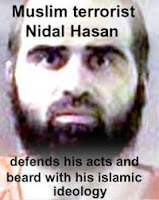 And what will Hasan do in representing himself...what will his defense be...NOTHING but jihadist rhetoric and rants using the qur'an to justify his actions, and the liberals sitting in the jury box...and rest assured there will be some bleeding heart liberals in that box...will lap it up so as NOT to appear racist against muslims (who are NOT a race by the way, but are people of all colors and nationalities who follow the pseudo-religious cult known as islam and NOTHING more). But if Hasan does become disruptive by spewing muslim garbage instead of questioning witnesses, which is very likely to happen, Hasan could lose the right to defend himself leaving it up to the judge and government lawyers to hold him accountable. Oh what theater we're all in for as the judge's ruling on Monday will determine if this trial becomes just more play acting at political correctness or if justice finally prevails for the Ft. 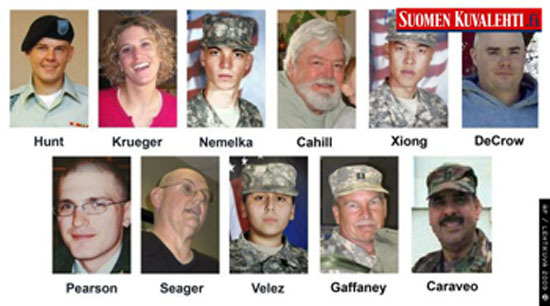 Hood victims and their families. I've got my front row TV seat saved and my popcorn ready to be 'nuked'...it should be interesting to say the least.